Try it for 60-days! If you don't like it, return it. It's that simple. Ask about our FREE EXTENDED WARRANTY promotion!!! Currently, we are offering a free extended warranty in exchange for pictures, video, and customer reviews. - We provide excellent tech support! You can call, text, or video-chat with Tech Support. Our tech support is available most evenings and weekends as well! - In-wall fit: Fits between standard 2 x 4 wall studs making installation easy. (in-wall dimensions: W 13 in. x H 11 in. x D 3.75 in.) 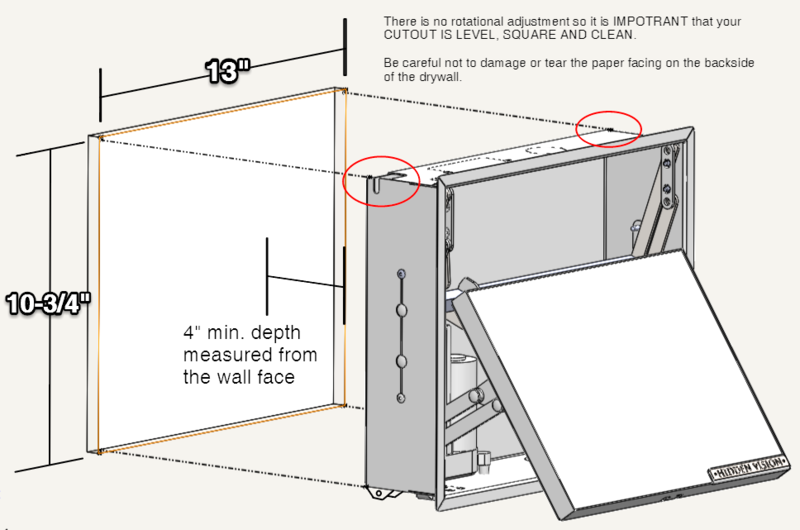 Simply cut your drywall out using the supplied template, insert the bracket into the opening and engage the retention tabs. - Full concealment: Flush mount installation holds a standard picture frame tight to the wall for perfect concealment. - Concealment option 3: Attach any panel. For example, you could layer a wall with ship-lap boards, attaching one row of boards to 1, 2, 3, or more of our products side-by-side, then lift the board to reveal your firearms! This is a great way to hide your firearms with style! - Fits nearly all handguns including revolvers: The hidden tray capacity is 11.5 (W) x 8.4 (H) x 1.9 (D) inches. - Magnetically held: Your handgun is held with supplied magnets that can be placed anywhere in the tray to hold any handgun. - Foam blanks: This product comes with 2 foam blanks. (1 for practice). Since the firearm is held with magnets use of the foam is optional. There are various methods for cutting foam (or you can order custom foam cutouts online from various websites). We've found the following tips to be helpful. 1. Trace your gun on the backside of the foam blank with a sharpy marker. 2. Get the foam wet and freeze it. 3. Place the foam on a scrap piece of cardboard (use a couple layers of cardboard if needed) The cardboard supports the foam and keeps the foam from buckling as you cut. USE A COPING SAW or JIGSAW BLADE to cut your outline rather than a knife. - Lock Option 3: Hidden Magnetic lock - A steel pivoting latch locks the bracket in the closed position. Place the supplied rare-earth magnet in the secret location on your picture frame to unlock and open. Each product has varying levels of security. Feel free to contact us to help you choose the right option for your situation. We recommend any firearms to be stored with additional security features such as a trigger lock. Please select the frame you would like (Click the picture of the frame to select it). Once you "click" you will see a “blue” outline appear around the picture. The blue outline will allow you to proceed to the next step to pick the mount size. No Frame. I'll Install my own.